We can rise to the Europe 2020 challenges of dealing with an ageing population, securing sustainable resources, developing clean energy supplies, improving healthcare and combating climate change – but only if we take effective short, medium and long term action. This is why the European Commission asked twenty five leading analysts to look into the future and workthrough a number of scenarios to see where the EU might be in 2050. 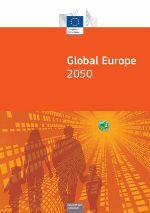 Their work, presented in this Global Europe 2050 report, analyses three key scenarios which describe different but nonetheless possible pathways that Europe could choose to follow over the decades to come. The first scenario is what if Nobody cares and Europe just muddles along with no clear vision or direction. In this scenario the analysis shows that economic growth will remain stubbornly lower than in the US and China, and that we will fail to exploit our potential for innovation and will, in consequence, lose our position in terms of global competitiveness to other regions in the world. At the other extreme, the EU under threat scenario paints a bleak picture of global economic decline followed by reactionary protectionist measures. The EU will see its share of world GDP fall by almost a half by 2050. Frequent food and oil crises will occur. EU Member States will become more inward-looking leading to inefficient fragmentation of effort that will touch every sector especially research – so vital for our future prosperity. Fortunately, the third scenario, which the experts call the European Renaissance, describes a much more attractive pathway. The EU continues to enlarge and become stronger. It consolidates its political, fiscal and military integration. Innovation systems become more efficient with an increased role given to users. Investment in technological and services innovations will have a direct impact on economic and social development. Member States will work together to make the European Research Area fully functional with research agendas being decided in common across Europe. EU GDP almost double by 2050. These scenarios are presented by some of Europe’s leading foresight and macro-economic modelling experts. Their work not only demonstrates the power of forward-looking exercises but lights the path to a better future – a path that we can and must follow. The first steps have already been taken. The EU 2020 strategy for smart, sustainable and inclusive growth has paved the way for the creation of the Innovation Union and led to a completely new EU approach for supporting research and innovation – Horizon 2020, which will help put the EU on the pathway towards a European Renaissance.